On average, seeds have more protein, folate, calcium, iron, vitamin B6, magnesium, phosphorous, potassium, riboflavin, zinc, and copper per unit weight than wheat. In addition, Sunflower seeds have vitamin E and pumpkin seeds have vitamin K.
Seeds have fiber, omega-3, vitamins, minerals, and other great nutrition not found in oil or butter. 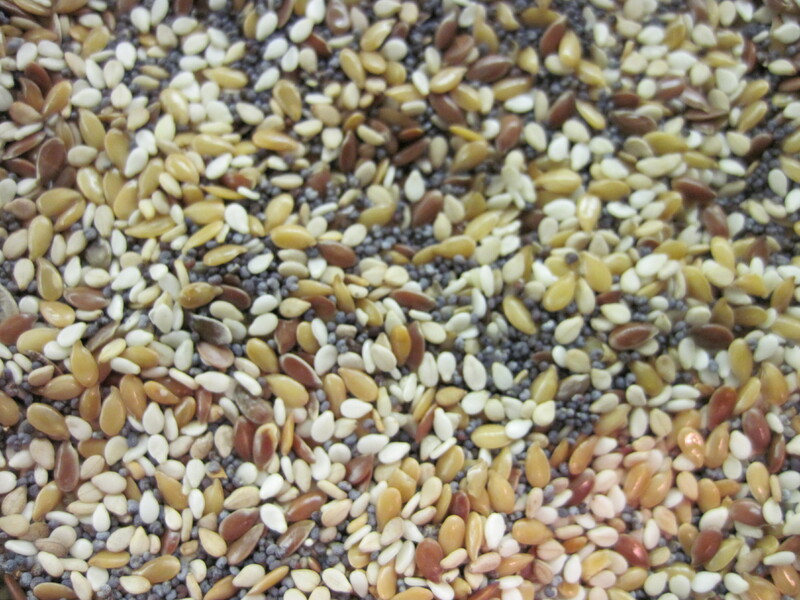 Combine equal parts of sesame, poppy, and flax seeds. Store in the freezer or refrigerator. Sesame comes in black and tan, flax in two shades of brown, and there are also chia, hemp, and other seeds you can consider adding to make as healthy and interesting an appearance to your baked goods as possible. Since I make crackers and chips a lot, I tend to leave sunflower and pepitas (pumpkin) seeds out of the mix and add them separately to other baked goods. If you have a flour mill that allows milling of seeds, you can add 1 tablespoon or so SSM or flax seed per cup of grain at milling time. Your body can absorb the nutrition from ground seeds better than it can from whole seeds. When I make bread dough, I sprinkle SSM into bread, cookie, cracker, and chip dough — all baked goods actually, and subtract the amount I use off of the oil or butter called for in the recipe. I prefer to used seeds instead of butter or oil, because they have half the calories, are delicious, and chock full of fiber, protein, vitamins and minerals. Butter has cholesterol and high amounts of saturated fat, and both Oil and butter have no fiber, protein, or minerals, and few if any vitamins. The figures are for 1 tablespoon of butter, oil, or seeds. This entry was posted in Nutrition and Cost, Recipes, Super Seed Mix, Whole Grain Mixes and tagged super seed mix. Bookmark the permalink.